Johnson's Oregon and Washington. Johnson's Minnesota. 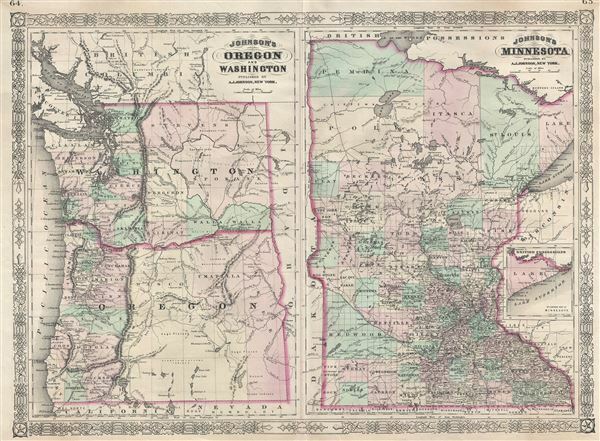 This is a beautiful 1866 hand colored map of Washington, Oregon and Minnesota by A. J. Johnson. One of the more interesting Johnson maps, this edition beautifully depicts railroads, wagon toads, Indian tribes, springs and fords, as well as the usual geographical and political features. Additionally shows important mountain passes, the route of famous explores and the route for the Pacific Railroad. Features the fretwork style border common to Johnson's atlas work from 1863 to 1869. Although copyrighted to 1865, this map was published by A. J. Johnson as plate nos. 64 and 65 in the 1866 edition of his New Illustrated Family Atlas of the World. Very good. Minor wear along original centerfold. Minor spotting at places.